David Parsons uses Arthur Greenspon’s 1968 photograph of a U.S. Army paratrooper in Vietnam to explore the different versions of history that have been presented to the public since 1968. Arthur Greenspon’s 1968 photograph of a U.S. Army paratrooper standing among his wounded comrades in the jungles of Vietnam, arms raised seemingly to the heavens, provides an excellent example of the power of images to influence historical memory. The photo’s mundane title, “No. 13” underscores its origins as just one of several hundred images captured by Greenspon during the chaotic Battle of Hue, a month-long campaign in South Vietnam that was part of the larger Tet Offensive. The resulting level of casualties rapidly eroded American troop morale and undermined support for the war at home, and these early months of 1968 are generally considered to be the critical turning point in American confidence about “winning” the Vietnam War. Although the image literally depicts a soldier raising his hands in order to guide a medical helicopter to a safe landing, a rather typical action in modern war, the photo takes on an iconic significance when considered within the larger context of American involvement in Vietnam and the political and cultural divisions it caused at home. The posture and tableau in the photo are reminiscent of religious imagery, particularly in depictions of the wounded Christ, raising his arms (literally) to heaven in archetypal agony and ecstasy. This soldier’s gesture seems to pose a similarly existential cry to the universe, mirroring the American public’s (and it would seem, much of the world’s) frustration and confusion at the ongoing slaughter in Vietnam. In addition to the war, the events of 1968, including the assassinations of Martin Luther King, Jr. and Robert Kennedy, urban riots, and the eruption of police violence at the Democratic National Convention in Chicago, so deeply traumatized U.S. society that the American public could only raise its own collective arms to the sky, as historical reality seemed increasingly beyond comprehension. 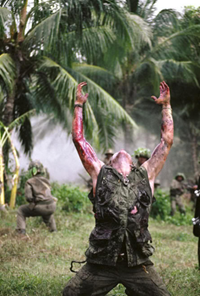 Perhaps what makes this image most historically significant, however, is its recreation by director and Vietnam combat veteran Oliver Stone in his 1986 film Platoon, in which Willem Dafoe’s character, Elias Barnes, is gunned down by enemy fire and memorably throws his hands in the air as he collapses in death (click here to see a side-by-side comparison). This iconic cinematic moment, which was featured on the film’s publicity posters and home video covers, consciously duplicates Greenspon’s image but adds an even more obvious Christ reference by infusing the gesture with literal death while underscoring (and arguably, helping to create) an important trope within the American public imagination regarding the history of the Vietnam War. As the immediate politics of the war waned in the 1980s, American popular culture began to explore its human costs in different terms, most often locating the war’s tragedy in the experiences and suffering of American combat troops. In this version of the Vietnam War narrative, Americans themselves become posed (both literally and metaphorically) as victims, helpless to even comprehend the scope of the tragedy that has befallen them. Thus Stone’s recreation fixes a specific political and cultural meaning upon Greenspon’s original composition, and creates an image that continues to impress powerfully on popular historical memory. In the courses I teach on the history of the Vietnam War, I often show extended clips of Platoon, in one exercise using the film as the springboard for a class discussion of different “versions” of history as reflected by comparison with the Greenspon photo. Most students seem to recognize that Platoon’s interpretation, which consciously situates American soldiers as flawed but essentially tragic figures, places a fixed melodramatic meaning on Greenspon’s more ambiguous composition. Nevertheless, the exercise asks students to consider pop culture iconography in a more critical way by (literally) showing them the historical origins of a carefully constructed Hollywood image that, ironically, far more Americans recognize than the “real” photograph it is based on. When he snapped this picture, Greenspon could not have possibly known that the image he captured would inspire a canonical moment in cinema that would become a kind of pop culture shorthand for the collective suffering of American soldiers and a repositioning of the terms of victimhood. Through its own unique path from the jungles of Vietnam to the fantasy factory of Hollywood, the haunting “No. 13” transcends the immediate moment it depicts, taking a slice of the chaos of war and amplifying the reality until it captures the pain and confusion of a tortured nation.